The Pacifica police and a group of rescue swimmers coordinate their efforts in order to reach the suspects aboard the yacht. Pacifica witnessed the misadventures of three amateur pirates on Monday, March 4. 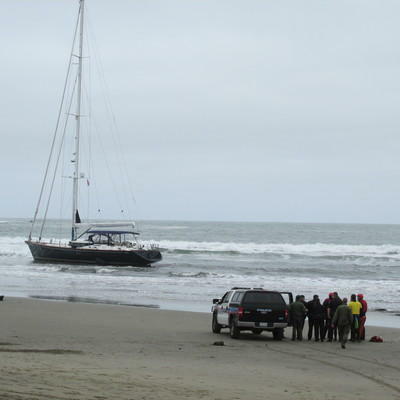 After sneaking aboard a luxury yacht in Sausalito Yacht Harbor at 1:30 a.m., the inexperienced suspects proceeded to run it aground about 20 yards off shore at Linda Mar at 5 a.m., according to the Pacifica Tribune. A civilian walking along the beach called the Coast Guard to report a yacht in distress, however, when firefighters and the Coast Guard arrived the three swashbucklers yelled that they were fine. Soon, television news crews arrived on the scene to capture the odd event on film. When the boat’s captain saw the yacht, named “Darling”, on an early morning news program, he called John Fruth, the boat’s owner, to alert him of the theft. Law enforcement quickly took over once it was revealed that the yacht was stolen. Police officers drew their guns and attempted to convince the pirates to disembark. In response, the three thieves swore profusely. As the drama continued to unfold, a crowd of at least 100 spectators gathered at the shore behind police tape. At noon, the suspects agreed to leave the boat. The San Mateo County Sheriff’s Office Water Rescue Team took them one by one to shore on jet skis before handing them over to the police. Leslie Gardner, 63, Dario Mira, 54, and Lisa Modawell, 56, were arrested on charges of grand theft and conspiracy. They may face higher bail or more serious charges because they stole a $2.7 million, three-cabin, three-bath luxury yacht and didn’t know how to steer it.